If you like to customize your desktop and regularly change your wallpaper then you should enjoy Desktopia. This free little application is simple and discreet but those the job. Coming with a suite of nice little wallpapers, it lets you easily add others and move them around in your list. You can set at what time particular wallpapers appear on your desktop. We also quite liked how easy it was to add new images just by dragging and dropping them into the list. From Desktopia's window you can preview all your wallpapers and decide to have them activated or not. Removing pictures that you're tired of is also extremely simple: just click on the red button in the menu bar. If you're thinking of setting different wallpapers for different times of the day then Desktopia is ideally suited for you. Desktopia is a cute little application to automatically change the wallpaper on your Mac. 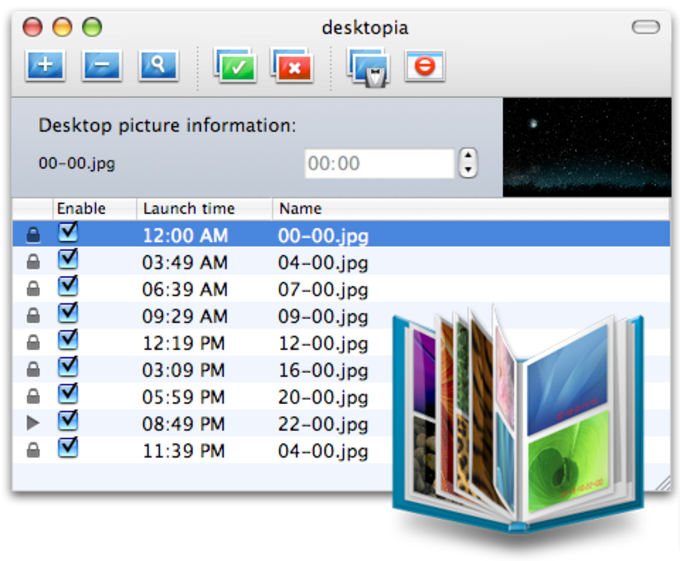 Desktopia is a brand new customization concept for MacOS X: if you are one of those that are always seeking for a new ways to improve the look of your mac then desktopia is the right choice. Desktopia is bundled with a specifically designed wallpaper-suite by Laurent Baumann. But you could also take pictures of your own garden at various times of the day! Totally useless. I downloaded this. I set up all my wallpapers, but then I found that anytime I put the computer into sleep mode the app closed down and wiped out all the schedules that I'd set up. So basically, I found it to be totally useless. Upgrade fail!. This used to be a great piece of software, but now it's a total flop. You can't Skip This Background anymore, as you could in the previous version; now you have to open a controller, and when you do, you still can't skip to the next one. ALL the cool wallpapers of the previouis version are gone. Now all you get are a few mediocre ones. GONE are all the wallpapers that you may have rated as having liked before. What do you think about Desktopia? Do you recommend it? Why?